I won’t go into what I thought the top news stories were this year. Instead, I want to say goodbye to 2013 by thanking you readers for telling me what matters to you the most. At the top, by a large margin, was my interview with Ronald Ebens, the killer of Vincent Chin. Conducted in 2012, the interview still draws readers who want to experience what I did in my phone conversation with Ebens–a sense of closure more than three decades after Chin’s vicious murder in Detroit. Of the blog posts this year, the one that resonated the most was on Ju Hong, the young activist in San Francisco who stood up to President Obama and asked him to do more to help the undocumented. 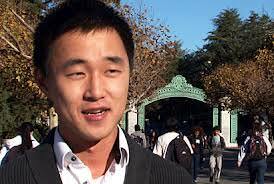 Shouting “Stop Deportations,” Hong did what few other Asian Americans are willing to do. He spoke out. He took a stand. And all at great personal risk. We can debate whether the president has the power or the political will to do what immigrant activists like Hong have demanded. But there’s no question, Hong must be admired. Even the president was impressed by Hong’s standing up and speaking out. The community would be so much further along if, in the name of social justice, we all had more amok moments. But it’s not easy to “go amok.” Despite the risks that many of us, or our families, took to get to America, standing up and speaking out is generally not our way. I believe in a democracy with absolute free speech rights, which means even racists are free to speak out. They just need to know that people will fire back at them with more speech. Some people call it debate. But it requires participation. When we don’t speak back, or at least speak out, we become much easier targets. And our opponents know it. We set our threshold high when it comes to transgressions allowed and suffer many little slights. We’ll wait for the ax-wielding racists to barge into our sphere. Anything less is but a mere paper cut, too small to get worked up about. But we smile as we bleed slowly to death. It means every slight deserves some kind of response. I know the movie Anchorman 2 is a silly trifle. But a Filipino dog joke is worth mentioning. Blacks wouldn’t give a watermelon or fried-chicken joke a free pass. Asian Americans shouldn’t in this case. Rounding out the top five is our post on the South Asian beauty Nina Davuluri winning the Miss America crown. It’s paired with my comment on CBS personality Julie Chen, who did whatever she needed to achieve her dream of anchor beauty. I still feel strongly that Chen could have challenged the racism she faced by speaking out, challenging, and fighting to change the system that made it impossible for her to advance because she was Asian American. Instead, she had an operation to change her looks, and, for good measure, married the network boss. As I’ve said, would Rosa Parks or Martin Luther King, Jr., facing similar obstacles, have sought out skin whitening? Or would they have stood up and fought against the big and small? There’s no better time than 2014 to rediscover the issues and ideas that will move our community forward, together.